Never Quit is the true story of how Jimmy Settle, an Alaskan shoe store clerk, became a Special Forces Operator and war hero. After being shot in the head during a dangerous high mountain operation in Afghanistan, Jimmy returns to battle with his teammates for a heroic rescue, the bullet fragments stitched over and still in his skull. In a cross between a suicide rescue mission and an against-all-odds mountain battle, his team of PJs risk their lives again in an epic firefight. When his helicopter is hit and begins leaking fuel, Jimmy finds himself in the worst possible position as a rescue specialist—forced to leave members from his own team behind. Jimmy will have to risk everything to get back into the battle and save his brothers. 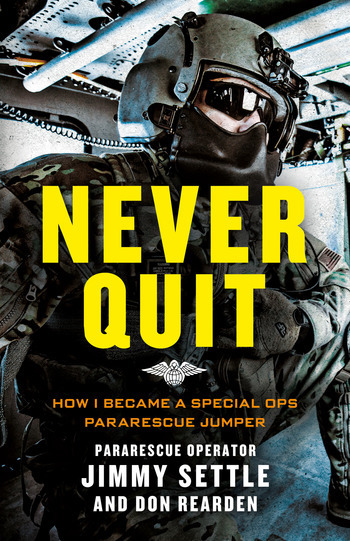 JIMMY SETTLE is an accomplished Pararescue Specialist in the Air Force, now retired. He was awarded a Purple Heart and an Airman’s Medal and with commendations for Valor in Afghanistan. He is credited for saving 38 lives, and assisting in 28 others in combat, and others in the Alaskan wilderness. He lives outside of Seattle. DON REARDEN is a professor, a produced screenwriter, and the author of The Washington Post Notable novel, The Raven’s Gift. He lives in Anchorage, Alaska.